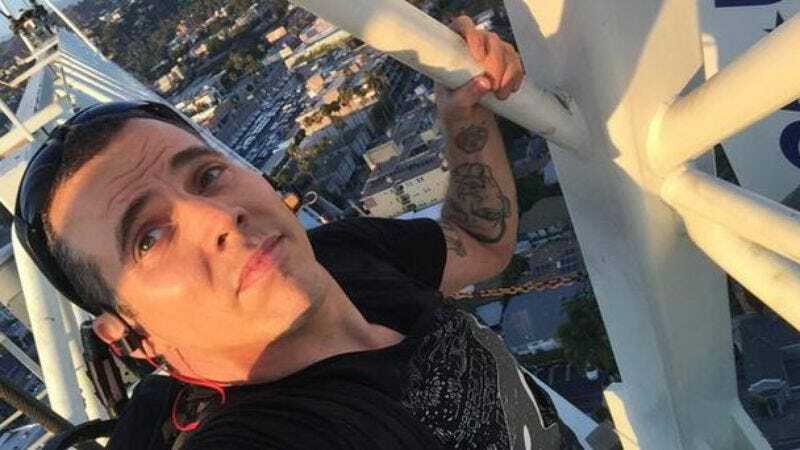 The saga of Steve-O (real name Steven-O) and his ill-conceived crane-based protest against SeaWorld has apparently reached its conclusion, as news network KTLA is reporting that Steve-O has just been sentenced to 30 days in jail. On top of that, Steve-O is getting 36 months of probation, during which he must stay 100 yards away from Hollywood “except for getting to and from his home while inside a vehicle.” He also cannot possess any fireworks or take part in any “staged fight in public, feigned medical emergency, or any other non-approved or non-permitted stunt or prank” that may result in an unnecessary response from police or firefighters. To Steve-O, this is presumably like being asked to go 36 months without oxygen. Steve-O himself commented on this sentencing with an Instagram post that features a comic of him and an orca imprisoned next to each other. In the caption, he explains that he’s ready to go to jail because it will “bring so much attention to the plight of orcas in captivity” and also because it will show people that he hasn’t lost his “edge.” Also, though he admits that he’s “a jackass,” he also announced a plan to “give back to the city of Los Angeles” by raising money for at-risk, inner-city youth with a raffle to get tickets to his upcoming Showtime comedy special.